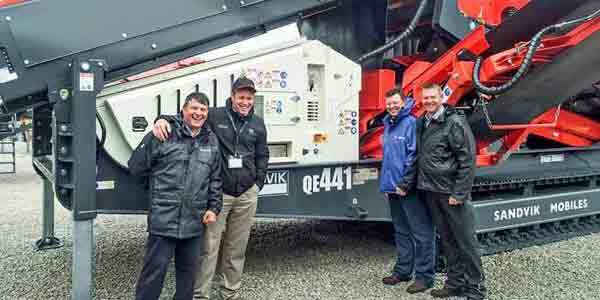 Manchester based J. O'Shea & Sons, a specialist bulk excavation and recycling company, has recently invested in a QE441 heavy duty scalping plant. This has been acquired in order to increase production at its C&D recycling operation. 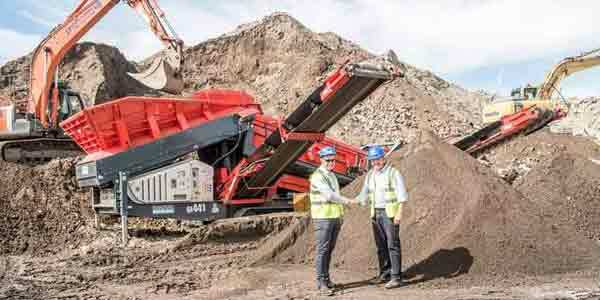 A valued Sandvik customer, J. O'Shea and Sons has owned Sandvik, and formerly Extec, equipment for the past 15 years. Family owned business J. O'Shea & Sons was initially established in 1959 and provides bulk excavation, haulage, demolition and more recently aggregate recycling for the construction industry. Currently operated by brothers John, Paul and Des O'Shea, it has continually expanded its business over the years. In addition to contracting services, the company is now considered to be one of the leading suppliers and distributors of recycled construction and demolition materials for use as aggregate in construction sites across the North West. In order to deliver materials and services, and to operate as a bulk haulage business, O'Sheas now operates an impressive fleet of 30 HGVs. Its fleet also includes 8 wheel tippers and grabs, and approximately 25 other machines consisting of excavators, loading shovels, dozers, dump trucks, crushers and screens for their plant hire operation. With the increasing demand for recycled material J. O'Sheas decided to invest in a QE341 mobile scalper for its recycling depot in Manchester 3 years ago. Due to the confined space on site, it was decided to take advantage of the versatility of the QE341, and configure this unit with both the mid- and fines conveyor on one side of the machine. This is a unique feature in this product category which almost halves the size of its required footprint. Re-positioning of the conveyors can easily be done on site with suitable lifting equipment. Over the past 3 years, the QE341 has more than adequately been doing the job it was intended for, processing recycled soil from hard-core material. As demand for recycled materials started to increase; the need for a larger model became apparent in order to fulfill O'Sheas customers' requirements. The ability to quickly process the sub-soil before it becomes too wet was identified, so the need for a scalper with a larger capacity was seen as important to the continued development of the company. Having used its equipment for many years, Sandvik was once again approached consulting with Area Sales Representative Fintan Harkin. O'Shea's immediately decided that the larger sibling of the QE341, the QE441 with a production capacity of up to 900 tph, would be the ideal solution to cater for its increased production needs. Developed for large aggregate producers, a key attribute of the QE441 is its large, highly aggressive 18 x 6' screenbox, which boasts a 40% larger screening area than the QE341 for maximum throughput. The larger model has been built with the same customer-focused characteristics as the QE341 with performance, ease of operation and maintenance at the forefront of design. This includes Sandvik's easy to use control system and user interface with sequential start, whilst two-speed tracking via radio remote control helps to reduce travel time between jobsites. Trouble-free operation is maintained through the apron feeder of the 8.5m³ wear a resistant hopper and 1600mm wide oversize conveyor, which assist with easy transfer of material to the product conveyors, even with large size or very difficult infeed material. With discharge heights in excess of 4000mm+, the wide, hydraulically folding and angle adjustable product conveyors on the crusher-style tracked chassis, further provide a large stockpiling capacity, which enables highly efficient productivity through a remote controlled operation. Sharing the same characteristics as the QE341, J. O'Sheas was already familiar with the features and design of the QE441. One of the key benefits that proved to be particularly beneficial was the versatility of the unit and ability to reposition the product conveyors. The QE441 was configured in the same way as the QE341 with both conveyors positioned on one side to reduce its operating footprint. To segregate the C&D waste, the screenbox was fitted with 75mm punch plate in the first section, then 50 mm tines in the top deck. Elongated 12 x 100 mm mesh was fitted to the bottom deck enabling the processing of the required fractions to produce materials for resale such as 6F5, 6F2, MOT and topsoil. Des O'Shea, Director of the company, has been delighted with the increased production capacity with the QE441. "We are now producing 90-110 tph more soil compared to the QE341 and are really happy with the machine," comments Des who adds, "We have also found the machine to be very reliable with minimum downtime." The QE441 has therefore replaced the QE341 in this application and the QE341 has since been transferred to O'Shea's 20 acre quarry in order to size down aggregates. 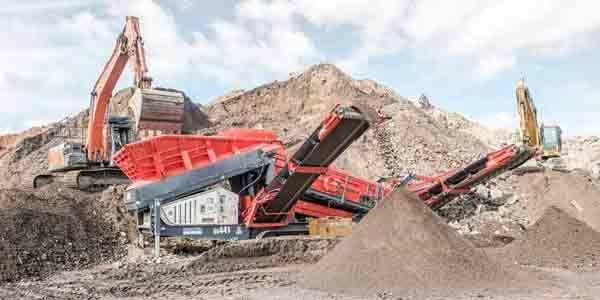 Sandvik mobile screening technology, together with the high level of service from Sandvik UK, has allowed J. O'Sheas to experience the very best in modern scalping equipment. This combination has boosted the production of high quality recycled materials in order to meet customer requirements. "We have used Sandvik for the past 15 years and have always found them to be reliable and do the job they were bought for" says Des. As well as the equipment, he explains how the backup is reliable and very good. "The expertise and support from our local Sales Representative, Fintan Harkin, is second to none. Fintan, as an ex-plant fitter, is not afraid to get his hands dirty when the need arises." Says Des, who concludes: "This puts Sandvik ahead of the competition in my opinion."